Are you asking the right questions when it comes to your content? How are your customers consuming it? How is it structured? 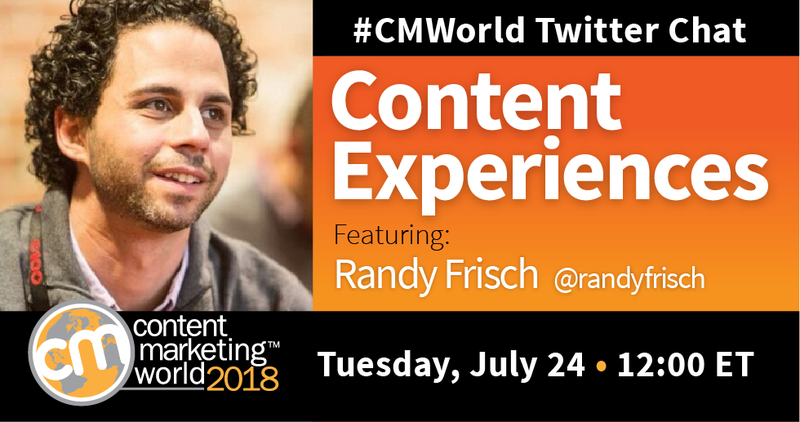 Randy Frisch suggests we start thinking “content experiences.” The co-founder and CMO of Uberflip joined us on a recent #CMWorld Twitter chat to discuss why creating these experiences are valuable to marketers today. What follow is a brief look at the Twitter chat. Check out our Twitter Moment to see more tweets from our discussion. What is a content experience and why does it matter? Experience creates and emotion, and EMOTIONS DRIVE ACTION. Marketing, operations, customer service, or someone else: Who in your organization should own the content experience? A2. Great question—it’s one that we talk about a lot at @Uberflip.
.@CMIContent #CMWorld A2: Owned by the leadership team, planned and co-ordinated by marketing. Champions/ambassadors across the business nominated to contribute. Feedback/reporting circulated to all. What do you think? What are your thoughts on creating content experiences? Let us know in the comments below. Get ready for the experience of a lifetime when you attend Content Marketing World 2018. It’s your chance to learn from the best in the business and network with marketers from around the globe. Secure your seat now with code SM100 to save $100 at checkout.